Mobeen Akhtar’s work reflects her admiration for Islamic arabesque and geometric patterns. She is best known for her meticulously detailed spiralling patterns, consisting of carefully placed motifs and stylised flowers. 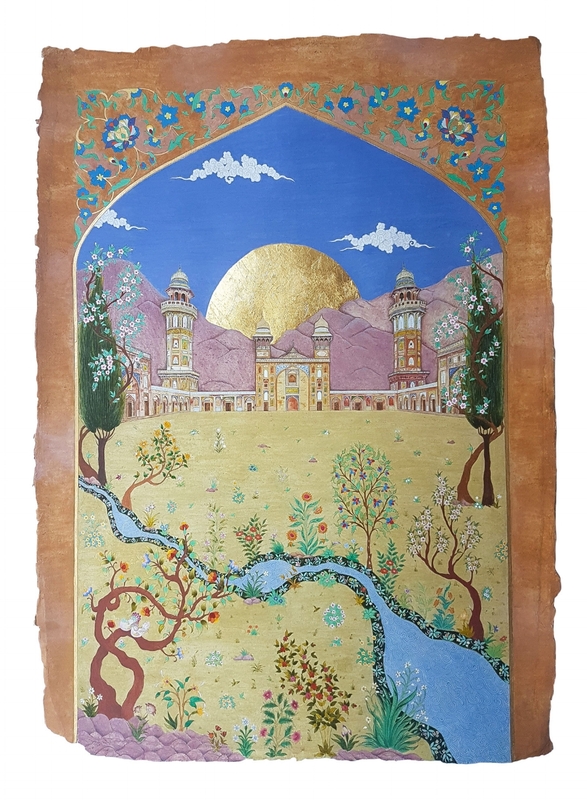 Inspired by the intricately illuminated pages of centuries old Quranic script, she aims to practice the traditional methods so they may be recognised and enjoyed today, as they were in the past. Through her own interpretation of Islamic art, she hopes to instigate a wider appreciation for it and encourage people to question and admire the techniques used to accomplish it. Continuously striving to evolve her work she has begun to experiment with historic and religious buildings and looks forward to including more significant Islamic architecture in her future work. Through her work, Mobeen is reminded of the perfection in God’s creations and the continuity which extends from Him alone. This profoundly inspires every piece of art work that she begins with the humble pencil and end with the stroke of a brush. Hand-ground pigment, gum arabic and 24k gold leaf on handmade wasli paper. This diptych is a prelude to the artist’s piece Garden of Reflection. It depicts two birds that are searching for one another, awaiting the promised reunion. The golden sun shines down on the birds as a symbol of light and hope. They fly from tree to tree in search of one another so they can join and rest together in the Gardens of Paradise. They knew each other once upon a time, they lost each other, but under the Light they will be reunited as promised by their Creator. The Noor (light) of God will shine over them, there will be peace, there will be love, and there will be an eternity together. Wazir Khan Mosque of Old Lahore boasts a vast range of stylized florals which adorns its tiles and fresco work. Taking inspiration from the same walls and ceilings, Mobeen envisages the return of the flowers and trees to their gardens of origin. The concept aims to capture a feeling of completeness, a journey back to the beginning, the closing of the circle. A rich colourful garden scene evokes visions of Paradise which awaits the return of the Mu’mineen (the faithful). Framed within an archway we visualise the entire structure and gardens beyond, a reflection of mankind’s search within themselves and contemplation of their place in existence.